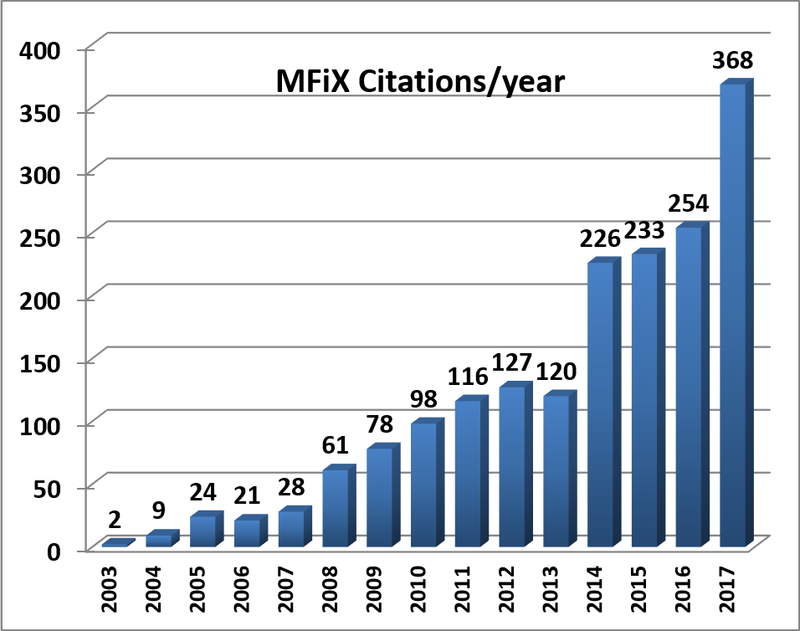 This page shows a non-comprehensive list of publications that 1) cite MFIX via the original 1993 MFIX documentation: theory guide which covers the basic MFIX model or 2) include MFIX in their abstract/title/keyword. Documents that describe later development in MFIX may be found in the documentation page and the development page (member’s area). This list is primarily generated from the ISI WWW of Knowledge bibliographic database using the above criteria and from SciTech Connect . 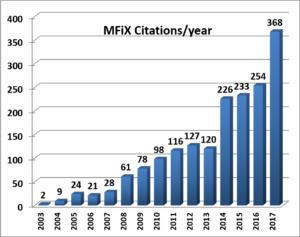 Most of the papers listed include discussions of simulation results generated with MFIX, but a few may only cite MFIX in passing. If your paper is not listed below, please send us the citation details to admin@mfix.netl.doe.gov . Shaohua Chen, Manogna Adepu, Heather Emady, Yang Jiao, Aytekin Gel, Enhancing the physical modeling capability of open-source MFIX-DEM software for handling particle size polydispersity: Implementation and validation, Powder Technology, Volume 317, 15 July 2017, Pages 117-125, ISSN 0032-5910, https://doi.org/10.1016/j.powtec.2017.04.055. Helal Uddin, Charles J. Coronella, Effects of grid size on predictions of bed expansion in bubbling fluidized beds of Geldart B particles: A generalized rule for a grid-independent solution of TFM simulations, Particuology, Volume 34, October 2017, Pages 61-69, ISSN 1674-2001, https://doi.org/10.1016/j.partic.2016.12.002. Mohammad Reza Haghgoo, Donald J. Bergstrom, Raymond J. Spiteri, Effect of particle stress tensor in simulations of dense gas–particle flows in fluidized beds, Particuology, Available online 31 August 2017, ISSN 1674-2001, https://doi.org/10.1016/j.partic.2017.04.010. Emilio Ramirez, Charles E.A. Finney, Sreekanth Pannala, C. Stuart Daw, Jack Halow, Qingang Xiong, Computational study of the bubbling-to-slugging transition in a laboratory-scale fluidized bed, Chemical Engineering Journal, Volume 308, 15 January 2017, Pages 544-556, ISSN 1385-8947, https://doi.org/10.1016/j.cej.2016.08.113. Carlos M. Romero Luna, Luis R. Carrocci, Gretta L.A.F. Arce, Ivonete Ávila, A comparative assessment of empirical and lattice Boltzmann method-based drag models for simulation of gas–solid flow hydrodynamics in a bubbling fluidized bed, Particuology, Volume 33, August 2017, Pages 129-137, ISSN 1674-2001, https://doi.org/10.1016/j.partic.2016.08.008. Mohammed N. Khan, Tariq Shamim, Influence of Specularity Coefficient on the Hydrodynamics and Bubble Statistics of an Annular Fluidized Bed Reactor, Energy Procedia, Volume 105, May 2017, Pages 1998-2003, ISSN 1876-6102, https://doi.org/10.1016/j.egypro.2017.03.573. L.M. Garcia-Gutierrez, F. Hernández-Jiménez, E. Cano-Pleite, A. Soria-Verdugo, Improvement of the simulation of fuel particles motion in a fluidized bed by considering wall friction, Chemical Engineering Journal, Volume 321, 1 August 2017, Pages 175-183, ISSN 1385-8947, https://doi.org/10.1016/j.cej.2017.03.109. Bahareh Estejab, Guevara Che Nyendu, Foster Agblevor, Francine Battaglia, Coal–biomass mixing characteristics in a bubbling fluidized bed of Geldart A particles, Chemical Engineering Research and Design, Volume 120, April 2017, Pages 1-14, ISSN 0263-8762, https://doi.org/10.1016/j.cherd.2017.01.025. Shuyan Wang, Baoli Shao, Xiangyu Li, Jian Zhao, Lili Liu, Yikun Liu, Yang Liu, Qun Dong, Simulations of vertical jet penetration using a filtered two-fluid model in a gas–solid fluidized bed, Particuology, Volume 31, April 2017, Pages 95-104, ISSN 1674-2001, https://doi.org/10.1016/j.partic.2016.05.013. Mohammad Reza Haghgoo, Donald J. Bergstrom, Raymond J. Spiteri, A comprehensive assessment of different wall boundary conditions on the simulation of bubbling fluidized beds, International Journal of Multiphase Flow, Available online 2 December 2017, ISSN 0301-9322, https://doi.org/10.1016/j.ijmultiphaseflow.2017.11.017. Xiaolai Zhang, Weixin Qian, Haitao Zhang, Qiwen Sun, Weiyong Ying, Effect of the operation parameters on the Fischer–Tropsch synthesis in fluidized bed reactors, Chinese Journal of Chemical Engineering, Available online 3 July 2017, ISSN 1004-9541, https://doi.org/10.1016/j.cjche.2017.05.012. Juhui Chen, Cheng Meng, Shuai Wang, Guangbin Yu, Ting Hu, Feng Lin, Effect of solid mass flux on anisotropic gas–solid flow in risers determined with an LES-SOM model, Particuology, Volume 34, October 2017, Pages 70-80, ISSN 1674-2001, https://doi.org/10.1016/j.partic.2016.12.003. Santhip K. Kanholy, Bahareh Estejab, Francine Battaglia, Modeling multiple gas jet interactions during fluidization in a pseudo-2D bed, Chemical Engineering Journal, Volume 328, 15 November 2017, Pages 1009-1021, ISSN 1385-8947, https://doi.org/10.1016/j.cej.2017.07.116. Huang Zhang, Shuiqing Li, DEM simulation of wet granular-fluid flows in spouted beds: Numerical studies and experimental verifications, Powder Technology, Volume 318, August 2017, Pages 337-349, ISSN 0032-5910, https://doi.org/10.1016/j.powtec.2017.05.009. Krzywanski, A. Żyłka, T. Czakiert, K. Kulicki, S. Jankowska, W. Nowak, A 1.5D model of a complex geometry laboratory scale fuidized bed clc equipment, Powder Technology, Volume 316, 1 July 2017, Pages 592-598, ISSN 0032-5910, https://doi.org/10.1016/j.powtec.2016.09.041. Sohail R. Reddy, Brian A. Freno, Paul G.A. Cizmas, Seckin Gokaltun, Dwayne McDaniel, George S. Dulikravich, Constrained reduced-order models based on proper orthogonal decomposition, Computer Methods in Applied Mechanics and Engineering, Volume 321, 1 July 2017, Pages 18-34, ISSN 0045-7825, https://doi.org/10.1016/j.cma.2017.03.038. Shwetank Yadav, Kinnor Chattopadhyay, Chandra Veer Singh, Solar grade silicon production: A review of kinetic, thermodynamic and fluid dynamics based continuum scale modeling, Renewable and Sustainable Energy Reviews, Volume 78, October 2017, Pages 1288-1314, ISSN 1364-0321, https://doi.org/10.1016/j.rser.2017.05.019. Zhang Qinghong, Wang Shuyan, Lu Huilin, Liu Guodong, Wang Shuai, Zhao Guangbo, A coupled Eulerian fluid phase-Eulerian solids phase-Lagrangian discrete particles hybrid model applied to gas-solids bubbling fluidized beds, Powder Technology, Volume 315, 15 June 2017, Pages 385-397, ISSN 0032-5910, https://doi.org/10.1016/j.powtec.2017.04.024. Ying Wang, Kenneth Williams, Mark Jones, Bin Chen, CFD simulation methodology for gas-solid flow in bypass pneumatic conveying – A review, Applied Thermal Engineering, Volume 125, October 2017, Pages 185-208, ISSN 1359-4311, https://doi.org/10.1016/j.applthermaleng.2017.05.063. Schalk Cloete, Abdelghafour Zaabout, Shahriar Amini, The Internally Circulating Reactor (ICR) Concept Applied to Pressurized Chemical Looping Processes, Energy Procedia, Volume 114, July 2017, Pages 446-457, ISSN 1876-6102, https://doi.org/10.1016/j.egypro.2017.03.1187. Hooshdaran, S.H. Hosseini, M. Haghshenasfard, M. Nasr Esfahany, M. Olazar, CFD modeling of heat transfer and hydrodynamics in a draft tube conical spouted bed reactor under pyrolysis conditions: Impact of wall boundary condition, Applied Thermal Engineering, Volume 127, 25 December 2017, Pages 224-232, ISSN 1359-4311, https://doi.org/10.1016/j.applthermaleng.2017.08.044. Andy Cahyadi, Shiliang Yang, Jia Wei Chew, CFD study on the hydrodynamics of fluidized granular activated carbon in AnFMBR applications, Separation and Purification Technology, Volume 178, 7 May 2017, Pages 75-89, ISSN 1383-5866, https://doi.org/10.1016/j.seppur.2017.01.023. Seyed Ahmad Kia, Javad Aminian, Hydrodynamic modeling strategy for dense to dilute gas–solid fluidized beds, Particuology, Volume 31, April 2017, Pages 105-116, ISSN 1674-2001, https://doi.org/10.1016/j.partic.2016.06.004. Shuyan Wang, Ruichao Tian, Haolong Li, Xiaoqi Li, Xu Wang, Jian Zhao, Lili Liu, Qiji Sun, Predictions of granular temperatures of particles in a flat bottomed spout bed, Powder Technology, Volume 322, December 2017, Pages 147-158, ISSN 0032-5910, https://doi.org/10.1016/j.powtec.2017.08.058. Marco Astolfi, Simone Mazzola, Paolo Silva, Ennio Macchi, A synergic integration of desalination and solar energy systems in stand-alone microgrids, Desalination, Volume 419, 1 October 2017, Pages 169-180, ISSN 0011-9164, https://doi.org/10.1016/j.desal.2017.05.025. Zahra Amiri, Salman Movahedirad, Bubble-induced particle mixing in a 2-D gas-solid fluidized bed with different bed aspect ratios: A CFD-DPM study, Powder Technology, Volume 320, October 2017, Pages 637-645, ISSN 0032-5910, https://doi.org/10.1016/j.powtec.2017.07.097. Liyan Sun, Kun Luo, Jianren Fan, Numerical study on flow behavior of ultrafine powders in conical spouted bed with coarse particles, Chemical Engineering Research and Design, Volume 125, September 2017, Pages 461-470, ISSN 0263-8762, https://doi.org/10.1016/j.cherd.2017.07.010. Bogdanova, E. George, N. Meynet, Y. Kara, A. Barba, Numerical CFD Simulations for Optimizing a Biomass Gasifier and Methanation Reactor Design and Operating Conditions, Energy Procedia, Volume 120, August 2017, Pages 278-285, ISSN 1876-6102, https://doi.org/10.1016/j.egypro.2017.07.209. A. Bakshi, C. Altantzis, L.R. Glicksman, A.F. Ghoniem, Gas-flow distribution in bubbling fluidized beds: CFD-based analysis and impact of operating conditions, Powder Technology, Volume 316, 1 July 2017, Pages 500-511, ISSN 0032-5910, https://doi.org/10.1016/j.powtec.2017.01.005. A. Nikolopoulos, A. Stroh, M. Zeneli, F. Alobaid, N. Nikolopoulos, J. Ströhle, S. Karellas, B. Epple, P. Grammelis, Numerical investigation and comparison of coarse grain CFD – DEM and TFM in the case of a 1 MWth fluidized bed carbonator simulation, Chemical Engineering Science, Volume 163, 18 May 2017, Pages 189-205, ISSN 0009-2509, https://doi.org/10.1016/j.ces.2017.01.052. Bayazid Mahmoodi, Seyyed Hossein Hosseini, Martin Olazar, Haritz Altzibar, CFD-DEM simulation of a conical spouted bed with open-sided draft tube containing fine particles, Journal of the Taiwan Institute of Chemical Engineers, Volume 81, December 2017, Pages 275-287, ISSN 1876-1070, https://doi.org/10.1016/j.jtice.2017.09.051. Dongyue Li, Hasse Christian, Simulation of bubbly flows with special numerical treatments of the semi-conservative and fully conservative two-fluid model, Chemical Engineering Science, Volume 174, 31 December 2017, Pages 25-39, ISSN 0009-2509, https://doi.org/10.1016/j.ces.2017.08.030. Long He, Danesh K. Tafti, Krishnamurthy Nagendra, Evaluation of drag correlations using particle resolved simulations of spheres and ellipsoids in assembly, Powder Technology, Volume 313, 15 May 2017, Pages 332-343, ISSN 0032-5910, https://doi.org/10.1016/j.powtec.2017.03.020. M. Helal Uddin, M. Arafat H. Khan, Charles J. Coronella, 3-D face-masking detection and tracking algorithm for bubble dynamics: Method and validation for gas–solid fluidized beds, Powder Technology, Volume 313, 15 May 2017, Pages 88-98, ISSN 0032-5910, https://doi.org/10.1016/j.powtec.2017.02.034. Paweł Kozołub, Adam Klimanek, Ryszard A. Białecki, Wojciech P. Adamczyk, Numerical simulation of a dense solid particle flow inside a cyclone separator using the hybrid Euler–Lagrange approach, Particuology, Volume 31, April 2017, Pages 170-180, ISSN 1674-2001, https://doi.org/10.1016/j.partic.2016.09.003. Jiageng Li, Bolun Yang, CFD simulation of bubbling fluidized beds using a local-structure-dependent drag model, Chemical Engineering Journal, Volume 329, 1 December 2017, Pages 100-115, ISSN 1385-8947, https://doi.org/10.1016/j.cej.2017.05.164. Yingying Hu, Jingfeng He, Yong Zhang, Peng Lv, Yanan Wang, Yuemin Zhao, Evaluation of air-dense medium fluidized beds with pulsatile inlet air, Chemical Engineering Science, Volume 158, 2 February 2017, Pages 164-171, ISSN 0009-2509, https://doi.org/10.1016/j.ces.2016.10.019. Wendell de Queiróz Lamas, Fabiano Fernandes Bargos, Giorgio Eugenio Oscare Giacaglia, Francisco José Grandinetti, Leandro de Moura, Numerical modelling and simulation of multi-phase flow through an industrial discharge chute, Applied Thermal Engineering, Volume 125, October 2017, Pages 937-950, ISSN 1359-4311, https://doi.org/10.1016/j.applthermaleng.2017.07.036. Thaar Al-Juwaya, Neven Ali, Muthanna Al-Dahhan, Investigation of cross-sectional gas-solid distributions in spouted beds using advanced non-invasive gamma-ray computed tomography (CT), Experimental Thermal and Fluid Science, Volume 86, September 2017, Pages 37-53, ISSN 0894-1777, https://doi.org/10.1016/j.expthermflusci.2017.03.029. Tianqi Tang, Yurong He, Tong Tai, Dongsheng Wen, DEM numerical investigation of wet particle flow behaviors in multiple-spout fluidized beds, Chemical Engineering Science, Volume 172, 23 November 2017, Pages 79-99, ISSN 0009-2509, https://doi.org/10.1016/j.ces.2017.06.025. Addison K. Stark, Christos Altantzis, Richard B. Bates, Ahmed F. Ghoniem, Towards an advanced reactor network modeling framework for fluidized bed biomass gasification: Incorporating information from detailed CFD simulations, Chemical Engineering Journal, Volume 303, 1 November 2016, Pages 409-424, ISSN 1385-8947, http://dx.doi.org/10.1016/j.cej.2016.06.026. Rosario Porrazzo, Graeme White, Raffaella Ocone, Fuel reactor modelling for chemical looping combustion: From micro-scale to macro-scale, Fuel, Volume 175, 1 July 2016, Pages 87-98, ISSN 0016-2361, http://dx.doi.org/10.1016/j.fuel.2016.01.041. Linbo Yan, C. Jim Lim, Guangxi Yue, Boshu He, John R. Grace, Simulation of biomass-steam gasification in fluidized bed reactors: Model setup, comparisons and preliminary predictions, Bioresource Technology, Volume 221, December 2016, Pages 625-635, ISSN 0960-8524, http://dx.doi.org/10.1016/j.biortech.2016.09.089. Farzaneh Jalalinejad, Xiaotao T. Bi, John R. Grace, Comparison of theory with experiment for single bubbles in charged fluidized particles, Powder Technology, Volume 290, March 2016, Pages 27-32, ISSN 0032-5910, http://dx.doi.org/10.1016/j.powtec.2015.12.014. Anil Yuksel, Michael Cullinan, Modeling of nanoparticle agglomeration and powder bed formation in microscale selective laser sintering systems, Additive Manufacturing, Volume 12, Part B, October 2016, Pages 204-215, ISSN 2214-8604, http://dx.doi.org/10.1016/j.addma.2016.07.002. J. Krzywanski, A. Żyłka, T. Czakiert, K. Kulicki, S. Jankowska, W. Nowak, A 1.5D model of a complex geometry laboratory scale fuidized bed clc equipment, Powder Technology, Available online 17 September 2016, ISSN 0032-5910, http://dx.doi.org/10.1016/j.powtec.2016.09.041. Tianqi Tang, Yurong He, Anxing Ren, Yunhua Zhao, Investigation on wet particle flow behavior in a riser using LES-DEM coupling approach, Powder Technology, Volume 304, December 2016, Pages 164-176, ISSN 0032-5910, http://dx.doi.org/10.1016/j.powtec.2016.08.023. Tsuyoshi Yamamoto, Takahiro Tsuboi, June Tatebayashi, A numerical simulation of PM adhesion characteristics in a fluidized bed type PM removal device by a finite volume Eulerian–Eulerian method, Powder Technology, Volume 288, January 2016, Pages 26-34, ISSN 0032-5910, http://dx.doi.org/10.1016/j.powtec.2015.10.033. Seyed Ahmad Kia, Javad Aminian, Hydrodynamic modeling strategy for dense to dilute gas–solid fluidized beds, Particuology, Available online 9 November 2016, ISSN 1674-2001, http://dx.doi.org/10.1016/j.partic.2016.06.004. A. Bakshi, C. Altantzis, R.B. Bates, A.F. Ghoniem, Study of the effect of reactor scale on fluidization hydrodynamics using fine-grid CFD simulations based on the two-fluid model, Powder Technology, Volume 299, October 2016, Pages 185-198, ISSN 0032-5910, http://dx.doi.org/10.1016/j.powtec.2016.05.029. M. Anil, S. Rupesh, C. Muraleedharan, P. Arun, Performance Evaluation of Fluidised Bed Biomass Gasifier Using CFD, Energy Procedia, Volume 90, December 2016, Pages 154-162, ISSN 1876-6102, http://dx.doi.org/10.1016/j.egypro.2016.11.180. Wei Zhang, Changfu You, Numerical simulation of particulate flows in CFB riser with drag corrections based on particle distribution characterization, Chemical Engineering Journal, Volume 303, 1 November 2016, Pages 145-155, ISSN 1385-8947, http://dx.doi.org/10.1016/j.cej.2016.05.139. A. Bakshi, C. Altantzis, R.B. Bates, A.F. Ghoniem, Multiphase-flow Statistics using 3D Detection and Tracking Algorithm (MS3DATA): Methodology and application to large-scale fluidized beds, Chemical Engineering Journal, Volume 293, 1 June 2016, Pages 355-364, ISSN 1385-8947, http://dx.doi.org/10.1016/j.cej.2016.02.058. Guodong Liu, Fan Yu, Huilin Lu, Shuai Wang, Pengwei Liao, Zhenhua Hao, CFD-DEM simulation of liquid-solid fluidized bed with dynamic restitution coefficient, Powder Technology, Volume 304, December 2016, Pages 186-197, ISSN 0032-5910, http://dx.doi.org/10.1016/j.powtec.2016.08.058. Shuai Wang, Juhui Chen, Qi Wang, Guodong Liu, Huilin Lu, Liyan Sun, Evaluation of a bubble-structure dependent drag model for the simulation of bubbling fluidization with Geldart A particles, Powder Technology, Volume 289, February 2016, Pages 44-51, ISSN 0032-5910, http://dx.doi.org/10.1016/j.powtec.2015.11.024. Shuai Wang, Qi Wang, Juhui Chen, Guodong Liu, Huilin Lu, Liyan Sun, Assessment of CO2 capture using potassium-based sorbents in circulating fluidized bed reactor by multiscale modeling, Fuel, Volume 164, 15 January 2016, Pages 66-72, ISSN 0016-2361, http://dx.doi.org/10.1016/j.fuel.2015.10.002. Shuai Wang, Qi Wang, Juhui Chen, Guodong Liu, Huilin Lu, Liyan Sun, Extension of cluster-structure dependent drag model to simulation of riser with Geldart B particles, Advanced Powder Technology, Volume 27, Issue 1, January 2016, Pages 57-63, ISSN 0921-8831, http://dx.doi.org/10.1016/j.apt.2015.10.015. Shuyan Wang, Xu Wang, Ruichen Wang, Juntian Zhao, Shuren Yang, Yang Liu, Qun Dong, Simulations of flow behavior of particles in a liquid-solid fluidized bed using a second-order moments model, Powder Technology, Volume 302, November 2016, Pages 21-32, ISSN 0032-5910, http://dx.doi.org/10.1016/j.powtec.2016.08.019. Qingang Xiong, Fei Xu, Emilio Ramirez, Sreekanth Pannala, C. Stuart Daw, Modeling the impact of bubbling bed hydrodynamics on tar yield and its fluctuations during biomass fast pyrolysis, Fuel, Volume 164, 15 January 2016, Pages 11-17, ISSN 0016-2361, http://dx.doi.org/10.1016/j.fuel.2015.09.074. Qingang Xiong, Jingchao Zhang, Fei Xu, Gavin Wiggins, C. Stuart Daw, Coupling DAEM and CFD for simulating biomass fast pyrolysis in fluidized beds, Journal of Analytical and Applied Pyrolysis, Volume 117, January 2016, Pages 176-181, ISSN 0165-2370, http://dx.doi.org/10.1016/j.jaap.2015.11.015. Peiyuan Liu, Casey Q. LaMarche, Kevin M. Kellogg, Christine M. Hrenya, Fine-particle defluidization: Interaction between cohesion, Young׳s modulus and static bed height, Chemical Engineering Science, Volume 145, 12 May 2016, Pages 266-278, ISSN 0009-2509, http://dx.doi.org/10.1016/j.ces.2016.02.024. Mohsen Fattahi, Seyyed Hossein Hosseini, Goodarz Ahmadi, CFD simulation of transient gas to particle heat transfer for fluidized and spouted regimes, Applied Thermal Engineering, Volume 105, 25 July 2016, Pages 385-396, ISSN 1359-4311, http://dx.doi.org/10.1016/j.applthermaleng.2015.05.071. Guoqiang Chen, Qinglin Su, Zhenghong Luo, Modeling the electrostatic effect on the hydrodynamic behavior in FCC risers: From understanding to application, Particuology, Volume 25, April 2016, Pages 122-132, ISSN 1674-2001, http://dx.doi.org/10.1016/j.partic.2015.05.008. F. Hernández-Jiménez, J. Sánchez-Prieto, E. Cano-Pleite, L.M. Garcia-Gutierrez, A. Acosta-Iborra, Development of an empirical wall-friction model for 2D simulations of pseudo-2D bubbling fluidized beds, Advanced Powder Technology, Volume 27, Issue 2, March 2016, Pages 521-530, ISSN 0921-8831, http://dx.doi.org/10.1016/j.apt.2016.02.001. Kunzan Qiu, Chenshu Hu, Shiliang Yang, Kun Luo, Ke Zhang, Jianren Fan, Computational evaluation of depth effect on the hydrodynamics of slot-rectangular spouted bed, Powder Technology, Volume 287, January 2016, Pages 51-60, ISSN 0032-5910, http://dx.doi.org/10.1016/j.powtec.2015.09.034. Nan Gui, Xingtuan Yang, Jiyuan Tu, Shengyao Jiang, A generalized particle-to-wall collision model for non-spherical rigid particles, Advanced Powder Technology, Volume 27, Issue 1, January 2016, Pages 154-163, ISSN 0921-8831, http://dx.doi.org/10.1016/j.apt.2015.12.002. O.O. Ayeni, C.L. Wu, K. Nandakumar, J.B. Joshi, Development and validation of a new drag law using mechanical energy balance approach for DEM–CFD simulation of gas–solid fluidized bed, Chemical Engineering Journal, Volume 302, 15 October 2016, Pages 395-405, ISSN 1385-8947, http://dx.doi.org/10.1016/j.cej.2016.05.056. Kun Hong, Sheng Chen, Wei Wang, Jinghai Li, Fine-grid two-fluid modeling of fluidization of Geldart A particles, Powder Technology, Volume 296, August 2016, Pages 2-16, ISSN 0032-5910, http://dx.doi.org/10.1016/j.powtec.2015.07.003. Jinghai Li, Wei Ge, Wei Wang, Ning Yang, Wenlai Huang, Focusing on mesoscales: from the energy-minimization multiscale model to mesoscience, Current Opinion in Chemical Engineering, Volume 13, August 2016, Pages 10-23, ISSN 2211-3398, http://dx.doi.org/10.1016/j.coche.2016.07.008. N. Setarehshenas, S.H. Hosseini, M. Nasr Esfahany, G. Ahmadi, Impacts of solid-phase wall boundary condition on CFD simulation of conical spouted beds containing heavy zirconia particles, Journal of the Taiwan Institute of Chemical Engineers, Volume 64, July 2016, Pages 146-156, ISSN 1876-1070, http://dx.doi.org/10.1016/j.jtice.2016.04.005. Yurong He, Wengen Peng, Tianqi Tang, Shengnan Yan, Yunhua Zhao, DEM numerical simulation of wet cohesive particles in a spout fluid bed, Advanced Powder Technology, Volume 27, Issue 1, January 2016, Pages 93-104, ISSN 0921-8831, http://dx.doi.org/10.1016/j.apt.2015.10.022. Lingyi Meng, Yang Jiao, Shuixiang Li, Maximally dense random packings of spherocylinders, Powder Technology, Volume 292, May 2016, Pages 176-185, ISSN 0032-5910, http://dx.doi.org/10.1016/j.powtec.2016.01.036. Wenguang Nan, Yueshe Wang, Jianzhong Wang, Numerical analysis on the fluidization dynamics of rodlike particles, Advanced Powder Technology, Volume 27, Issue 5, September 2016, Pages 2265-2276, ISSN 0921-8831, http://dx.doi.org/10.1016/j.apt.2016.08.015. Mohammad Mehrabadi, Sudheer Tenneti, Shankar Subramaniam, Importance of the fluid-particle drag model in predicting segregation in bidisperse gas-solid flow, International Journal of Multiphase Flow, Volume 86, November 2016, Pages 99-114, ISSN 0301-9322, http://dx.doi.org/10.1016/j.ijmultiphaseflow.2016.07.006. Cesar M. Venier, Santiago Marquez Damian, Norberto M. Nigro, Numerical aspects of Eulerian gas–particles flow formulations, Computers & Fluids, Volume 133, 15 July 2016, Pages 151-169, ISSN 0045-7930, http://dx.doi.org/10.1016/j.compfluid.2016.05.003. Wenqi Zhong, Aibing Yu, Guanwen Zhou, Jun Xie, Hao Zhang, CFD simulation of dense particulate reaction system: Approaches, recent advances and applications, Chemical Engineering Science, Volume 140, 2 February 2016, Pages 16-43, ISSN 0009-2509, http://dx.doi.org/10.1016/j.ces.2015.09.035. Ahmadreza Abbasi Baharanchi, Seckin Gokaltun, George Dulikravich, Performance improvement of existing drag models in two-fluid modeling of gas–solid flows using a PR-DNS based drag model, Powder Technology, Volume 286, December 2015, Pages 257-268, ISSN 0032-5910, http://dx.doi.org/10.1016/j.powtec.2015.07.001. Li Peng, Yingya Wu, Chengxiu Wang, Jinsen Gao, Xingying Lan, 2.5D CFD simulations of gas–solids flow in cylindrical CFB risers, Powder Technology, Available online 31 December 2015, ISSN 0032-5910, http://dx.doi.org/10.1016/j.powtec.2015.12.018. Farzaneh Jalalinejad, Xiaotao T. Bi, John R. Grace, Effect of electrostatics on interaction of bubble pairs in a fluidized bed, Advanced Powder Technology, Volume 26, Issue 1, January 2015, Pages 329-334, ISSN 0921-8831, http://dx.doi.org/10.1016/j.apt.2014.10.015. Anna Trendewicz, Robert Braun, Abhijit Dutta, Jack Ziegler, Corrigendum to “One dimensional steady-state circulating fluidized-bed reactor model for biomass fast pyrolysis” [Fuel 133 (2014) 253–262], Fuel, Volume 144, 15 March 2015, Pages 439-440, ISSN 0016-2361, http://dx.doi.org/10.1016/j.fuel.2014.12.053. Farzaneh Jalalinejad, Xiaotao T. Bi, John R. Grace, Comparison of theory with experiment for single bubbles in charged fluidized particles, Powder Technology, Available online 17 December 2015, ISSN 0032-5910, http://dx.doi.org/10.1016/j.powtec.2015.12.014. Farzaneh Jalalinejad, Xiaotao T. Bi, John R. Grace, Effect of electrostatics on freely-bubbling beds of mono-sized particles, International Journal of Multiphase Flow, Volume 70, April 2015, Pages 104-112, ISSN 0301-9322, http://dx.doi.org/10.1016/j.ijmultiphaseflow.2014.11.007. Xuesong Lu, Chris M. Boyce, Stuart A. Scott, John S. Dennis, Daniel J. Holland, Investigation of Two-fluid Models of Fluidisation Using Magnetic Resonance and Discrete Element Simulations, Procedia Engineering, Volume 102, 2015, Pages 1436-1445, ISSN 1877-7058, http://dx.doi.org/10.1016/j.proeng.2015.01.277. Shuyan Wang, Qian Yang, Baoli Shao, Jian Zhao, Lili Liu, Yikun Liu, Numerical simulation of horizontal jet penetration using filtered fluid model in gas–solid fluidized bed, Powder Technology, Volume 276, May 2015, Pages 1-9, ISSN 0032-5910, http://dx.doi.org/10.1016/j.powtec.2015.02.009. A.B. Morris, S. Pannala, Z. Ma, C.M. Hrenya, A conductive heat transfer model for particle flows over immersed surfaces, International Journal of Heat and Mass Transfer, Volume 89, October 2015, Pages 1277-1289, ISSN 0017-9310, http://dx.doi.org/10.1016/j.ijheatmasstransfer.2015.06.004. Maryam Askarishahi, Mohammad-Sadegh Salehi, Hamid Reza Godini, Günter Wozny, CFD study on solids flow pattern and solids mixing characteristics in bubbling fluidized bed: Effect of fluidization velocity and bed aspect ratio, Powder Technology, Volume 274, April 2015, Pages 379-392, ISSN 0032-5910, http://dx.doi.org/10.1016/j.powtec.2015.01.025. Matthew R. Sweeney, Greg A. Valentine, Transport and mixing dynamics from explosions in debris-filled volcanic conduits: Numerical results and implications for maar-diatreme volcanoes, Earth and Planetary Science Letters, Volume 425, 1 September 2015, Pages 64-76, ISSN 0012-821X, http://dx.doi.org/10.1016/j.epsl.2015.05.038. X. Hu, A. Passalacqua, R.O. Fox, Application of quadrature-based uncertainty quantification to the NETL small-scale challenge problem SSCP-I, Powder Technology, Volume 272, March 2015, Pages 100-112, ISSN 0032-5910, http://dx.doi.org/10.1016/j.powtec.2014.11.030. F. Hernández-Jiménez, L.M. García-Gutiérrez, A. Soria-Verdugo, A. Acosta-Iborra, Fully coupled TFM-DEM simulations to study the motion of fuel particles in a fluidized bed, Chemical Engineering Science, Volume 134, 29 September 2015, Pages 57-66, ISSN 0009-2509, http://dx.doi.org/10.1016/j.ces.2015.04.028. Jian Cai, Masato Handa, Michael F. Modest, Eulerian–Eulerian multi-fluid methods for pulverized coal flames with nongray radiation, Combustion and Flame, Volume 162, Issue 4, April 2015, Pages 1550-1565, ISSN 0010-2180, http://dx.doi.org/10.1016/j.combustflame.2014.11.023. Qinggong Wang, Hairui Yang, Yuqing Feng, Peter J. Witt, Junfu Lu, Weidi Yin, Qing Liu, Lubin Wei, Numerical study of the effect of operation parameters on particle segregation in a coal beneficiation fluidized bed by a TFM–DEM hybrid model, Chemical Engineering Science, Volume 131, 28 July 2015, Pages 256-270, ISSN 0009-2509, http://dx.doi.org/10.1016/j.ces.2015.03.063. Meisam Farzaneh, Alf-Erik Almstedt, Filip Johnsson, David Pallarès, Srdjan Sasic, The crucial role of frictional stress models for simulation of bubbling fluidized beds, Powder Technology, Volume 270, Part A, January 2015, Pages 68-82, ISSN 0032-5910, http://dx.doi.org/10.1016/j.powtec.2014.09.050. Shigan Chu, Andrea Prosperetti, On flux terms in volume averaging, International Journal of Multiphase Flow, Available online 31 December 2015, ISSN 0301-9322, http://dx.doi.org/10.1016/j.ijmultiphaseflow.2015.12.009. Caterina Gonçalves Philippsen, Antônio Cezar Faria Vilela, Leandro Dalla Zen, Fluidized bed modeling applied to the analysis of processes: review and state of the art, Journal of Materials Research and Technology, Volume 4, Issue 2, April–June 2015, Pages 208-216, ISSN 2238-7854, http://dx.doi.org/10.1016/j.jmrt.2014.10.018. Yu Ri Lee, Hang Seok Choi, Hoon Chae Park, Ji Eun Lee, A numerical study on biomass fast pyrolysis process: A comparison between full lumped modeling and hybrid modeling combined with CFD, Computers & Chemical Engineering, Volume 82, 2 November 2015, Pages 202-215, ISSN 0098-1354, http://dx.doi.org/10.1016/j.compchemeng.2015.07.007. Qingang Xiong, Jingchao Zhang, Fei Xu, Gavin Wiggins, C. Stuart Daw, Coupling DAEM and CFD for simulating biomass fast pyrolysis in fluidized beds, Journal of Analytical and Applied Pyrolysis, Available online 3 December 2015, ISSN 0165-2370, http://dx.doi.org/10.1016/j.jaap.2015.11.015. Shuai Wang, Qi Wang, Juhui Chen, Guodong Liu, Huilin Lu, Liyan Sun, Extension of cluster-structure dependent drag model to simulation of riser with Geldart B particles, Advanced Powder Technology, Available online 6 November 2015, ISSN 0921-8831, http://dx.doi.org/10.1016/j.apt.2015.10.015. A. Bakshi, C. Altantzis, R.B. Bates, A.F. Ghoniem, Eulerian–Eulerian simulation of dense solid–gas cylindrical fluidized beds: Impact of wall boundary condition and drag model on fluidization, Powder Technology, Volume 277, June 2015, Pages 47-62, ISSN 0032-5910, http://dx.doi.org/10.1016/j.powtec.2015.02.056. Yunhua Zhao, Bing Lu, Yingjie Zhong, Influence of collisional parameters for rough particles on simulation of a gas-fluidized bed using a two-fluid model, International Journal of Multiphase Flow, Volume 71, May 2015, Pages 1-13, ISSN 0301-9322, http://dx.doi.org/10.1016/j.ijmultiphaseflow.2014.12.002. Nan Gui, Xingtuan Yang, Jiyuan Tu, Shengyao Jiang, A generalized particle-to-wall collision model for non-spherical rigid particles, Advanced Powder Technology, Available online 15 December 2015, ISSN 0921-8831, http://dx.doi.org/10.1016/j.apt.2015.12.002. Diego Perrone, Mario Amelio, A Preliminary Study of Hydrodynamics and Heat Transfer in a Bubbling Fluidized Bed Containing Sand Particle Using CFD, Energy Procedia, Volume 81, December 2015, Pages 1041-1054, ISSN 1876-6102, http://dx.doi.org/10.1016/j.egypro.2015.12.113. Oyebanjo Oke, Paola Lettieri, Piero Salatino, Roberto Solimene, Luca Mazzei, Eulerian Modeling of Lateral Solid Mixing in Gas-fluidized Suspensions, Procedia Engineering, Volume 102, 2015, Pages 1491-1499, ISSN 1877-7058, http://dx.doi.org/10.1016/j.proeng.2015.01.283. Qinggong Wang, Weidi Yin, Hairui Yang, Junfu Lu, Bin Zhao, Numerical study on the effect of fine coal accumulation in a coal beneficiation fluidized bed, Powder Technology, Volume 283, October 2015, Pages 570-578, ISSN 0032-5910, http://dx.doi.org/10.1016/j.powtec.2015.06.007. Shuai Wang, Juhui Chen, Huilin Lu, Guodong Liu, Liyan Sun, Multi-scale simulation of chemical looping combustion in dual circulating fluidized bed, Applied Energy, Volume 155, 1 October 2015, Pages 719-727, ISSN 0306-2619, http://dx.doi.org/10.1016/j.apenergy.2015.05.109. Guoqiang Chen, Qinglin Su, Zhenghong Luo, Modeling the electrostatic effect on the hydrodynamic behavior in FCC risers: From understanding to application, Particuology, Available online 11 September 2015, ISSN 1674-2001, http://dx.doi.org/10.1016/j.partic.2015.05.008. Youjun Lu, Jikai Huang, Pengfei Zheng, A CFD–DEM study of bubble dynamics in fluidized bed using flood fill method, Chemical Engineering Journal, Volume 274, 15, August 2015, Pages 123-131, ISSN 1385-8947, http://dx.doi.org/10.1016/j.cej.2015.03.117. Qinggong Wang, Timo Niemi, Juho Peltola, Sirpa Kallio, Hairui Yang, Junfu Lu, Lubin Wei, Particle size distribution in CPFD modeling of gas–solid flows in a CFB riser, Particuology, Volume 21, August 2015, Pages 107-117, ISSN 1674-2001, http://dx.doi.org/10.1016/j.partic.2014.06.009. R. Berger, C. Kloss, A. Kohlmeyer, S. Pirker, Hybrid parallelization of the LIGGGHTS open-source DEM code, Powder Technology, Volume 278, July 2015, Pages 234-247, ISSN 0032-5910, http://dx.doi.org/10.1016/j.powtec.2015.03.019. Bruno Blais, François Bertrand, On the use of the method of manufactured solutions for the verification of CFD codes for the volume-averaged Navier–Stokes equations, Computers & Fluids, Volume 114, 2 July 2015, Pages 121-129, ISSN 0045-7930, http://dx.doi.org/10.1016/j.compfluid.2015.03.002. Seyyed Hossein Hosseini, Mohsen Fattahi, Goodarz Ahmadi, Hydrodynamics studies of a pseudo 2D rectangular spouted bed by CFD, Powder Technology, Volume 279, July 2015, Pages 301-309, ISSN 0032-5910, http://dx.doi.org/10.1016/j.powtec.2015.04.013. Mohsen Fattahi, Seyyed Hossein Hosseini, Goodarz Ahmadi, CFD simulation of transient gas to particle heat transfer for fluidized and spouted regimes, Applied Thermal Engineering, Available online 5 June 2015, ISSN 1359-4311, http://dx.doi.org/10.1016/j.applthermaleng.2015.05.071. Ahmed Ramzy, Ravikiran Kadoli, Modified PGC model and its validation by experiments for heat and moisture transfer analysis in a vertical fluidized desiccant bed, Applied Thermal Engineering, Volume 81, 25 April 2015, Pages 83-91, ISSN 1359-4311, http://dx.doi.org/10.1016/j.applthermaleng.2015.02.018. Kun Luo, Fan Wu, Shiliang Yang, Jianren Fan, CFD–DEM study of mixing and dispersion behaviors of solid phase in a bubbling fluidized bed, Powder Technology, Volume 274, April 2015, Pages 482-493, ISSN 0032-5910, http://dx.doi.org/10.1016/j.powtec.2015.01.046. Yurong He, Wengen Peng, Tianqi Tang, Shengnan Yan, Yunhua Zhao, DEM numerical simulation of wet cohesive particles in a spout fluid bed, Advanced Powder Technology, Available online 14 November 2015, ISSN 0921-8831, http://dx.doi.org/10.1016/j.apt.2015.10.022. Qinggong Wang, Yuqing Feng, Junfu Lu, Weidi Yin, Hairui Yang, Peter J. Witt, Man Zhang, Numerical study of particle segregation in a coal beneficiation fluidized bed by a TFM–DEM hybrid model: Influence of coal particle size and density, Chemical Engineering Journal, Volume 260, 15 January 2015, Pages 240-257, ISSN 1385-8947, http://dx.doi.org/10.1016/j.cej.2014.08.052. C. Altantzis, R.B. Bates, A.F. Ghoniem, 3D Eulerian modeling of thin rectangular gas–solid fluidized beds: Estimation of the specularity coefficient and its effects on bubbling dynamics and circulation times, Powder Technology, Volume 270, Part A, January 2015, Pages 256-270, ISSN 0032-5910, http://dx.doi.org/10.1016/j.powtec.2014.10.029. Kun Hong, Sheng Chen, Wei Wang, Jinghai Li, Fine-grid two-fluid modeling of fluidization of Geldart A particles, Powder Technology, Available online 9 July 2015, ISSN 0032-5910, http://dx.doi.org/10.1016/j.powtec.2015.07.003. Darius Markauskas, Arnas Kačeniauskas, The comparison of two domain repartitioning methods used for parallel discrete element computations of the hopper discharge, Advances in Engineering Software, Volume 84, June 2015, Pages 68-76, ISSN 0965-9978, http://dx.doi.org/10.1016/j.advengsoft.2014.12.002. T.M. Ismail, M. Abd El-Salam, Numerical and experimental studies on updraft gasifier HTAG, Renewable Energy, Volume 78, June 2015, Pages 484-497, ISSN 0960-1481, http://dx.doi.org/10.1016/j.renene.2015.01.032. Yuli Zhang, Mao Ye, Yinfeng Zhao, Tong Gu, Rui Xiao, Zhongmin Liu, Emulsion phase expansion of Geldart a particles in bubbling fluidized bed methanation reactors: A CFD–DEM study, Powder Technology, Volume 275, May 2015, Pages 199-210, ISSN 0032-5910, http://dx.doi.org/10.1016/j.powtec.2015.01.064. Sergey Zabelok, Robert Arslanbekov, Vladimir Kolobov, Adaptive kinetic-fluid solvers for heterogeneous computing architectures, Journal of Computational Physics, Volume 303, 15 December 2015, Pages 455-469, ISSN 0021-9991, http://dx.doi.org/10.1016/j.jcp.2015.10.003. Benjamin Amblard, Stéphane Bertholin, Carole Bobin, Thierry Gauthier, Development of an attrition evaluation method using a Jet Cup rig, Powder Technology, Volume 274, April 2015, Pages 455-465, ISSN 0032-5910, http://dx.doi.org/10.1016/j.powtec.2015.01.001. Shiliang Yang, Kun Luo, Ke Zhang, Kunzan Qiu, Jianren Fan, Numerical study of a lab-scale double slot-rectangular spouted bed with the parallel CFD–DEM coupling approach, Powder Technology, Volume 272, March 2015, Pages 85-99, ISSN 0032-5910, http://dx.doi.org/10.1016/j.powtec.2014.11.035. Jan Marti, Andreas Haselbacher, Aldo Steinfeld, A numerical investigation of gas-particle suspensions as heat transfer media for high-temperature concentrated solar power, International Journal of Heat and Mass Transfer, Volume 90, November 2015, Pages 1056-1070, ISSN 0017-9310, http://dx.doi.org/10.1016/j.ijheatmasstransfer.2015.07.033. E. Cano-Pleite, F. Hernández-Jiménez, A. Acosta-Iborra, Compressible-gas two-fluid modeling of isolated bubbles in a vertically vibrated fluidized bed and comparison with experiments, Chemical Engineering Journal, Volume 271, 1 July 2015, Pages 287-299, ISSN 1385-8947, http://dx.doi.org/10.1016/j.cej.2015.02.096. Holloway William, Sundaresan Sankaran. Filtered models for bidisperse gas-particle flows. Chemical Engineering Science. 2014 Apr 28;108:67-86. http://dx.doi.org/10.1016/j.ces.2013.12.037. P.J. Abrahamsson, S. Sasic, A. Rasmuson, On continuum modeling using kinetic-frictional models in high shear granulation, Particuology, Volume 13, April 2014, Pages 124-127.http://dx.doi.org/10.1016/j.partic.2013.06.001 . Agarwal, Khushbu, Poorva Sharma, Jinliang Ma, Chaomei Lo, Ian Gorton, and Yan Liu. 2014. Reveal: An extensible reduced-order model builder for simulation and modeling. Computing in Science & Engineering 16, (2): 44-53. http://dx.doi.org/10.1109/MCSE.2013.46 . Fabio Dioguardi, Pierfrancesco Dellino, Daniela Mele, Integration of a new shape-dependent particle-fluid drag coefficient law in the multiphase Eulerian-Lagrangian code MFIX-DEM, Powder Technology, Volume 260, July 2014, Pages 68-77. http://dx.doi.org/10.1016/j.powtec.2014.03.071. Du, Juan, Soham Dutta, and Birger Erik Ydstie. 2014. Modeling and control of solar?grade silicon production in a fluidized bed reactor. AIChE Journal 60, (5): 1740-1751.. http://dx.doi.org/10.1002/aic.14378 . F. Hernandez-Jimenez, T. Li, E. Cano-Pleite, W. Rogers, A. Acosta-Iborra, Characterization of the particle-wall frictional forces in pseudo-2D fluidized beds using DEM, Chemical Engineering Science, Volume 116, 6 September 2014, Pages 136-143. http://dx.doi.org/10.1016/j.ces.2014.04.033. Lee, Ji Eun, Hang Seok Choi, and Yong Chil Seo. 2014. Study of hydrodynamic characteristics in a circulating fluidized bed gasifier for plastic waste by computational fluid dynamics modeling and simulation. Journal of Material Cycles and Waste Management 16, (4): 665-676.. http://dx.doi.org/10.1007/s10163-014-0275-5 . Peiyuan Liu, Christine M. Hrenya, Challenges of DEM: I. Competing bottlenecks in parallelization of gas-solid flows, Powder Technology, Volume 264, September 2014, Pages 620-626. http://dx.doi.org/10.1016/j.powtec.2014.04.095. Chanchal Loha, Himadri Chattopadhyay, Pradip K. Chatterjee, Effect of coefficient of restitution in Euler-Euler CFD simulation of fluidized-bed hydrodynamics, Particuology, Volume 15, August 2014, Pages 170-177.http://dx.doi.org/10.1016/j.partic.2013.07.001 . Andreza Tangerino Mineto , Meire Pereira de Souza Braun , Helio Aparecido Navarro , Luben Cabezas-Gomez.Influence Of The Granular Temperature In The Numerical Simulation Of Gas-Solid Flow In A Bubbling Fluidized Bed. Chemical Engineering Communications, Volume 201, Issue 8, August 2014.http://dx.doi.org/10.1080/00986445.2013.794138. Thomas J. O’Brien, A multiphase turbulence theory for gas-solid flows: I. Continuity and momentum equations with Favre-averaging, Powder Technology, Volume 265, October 2014, Pages 83-87. http://dx.doi.org/10.1016/j.powtec.2014.01.030. Rangarajan D, Shiozawa T, Shen Y, Curtis JS, Yu A. Influence of operating parameters on raceway properties in a model blast furnace using two-fluid model. Ind Eng Chem , 2014,53,4983-4990.http://dx.doi.org/10.1021/ie301936r . Sweeney, Matthew R. A Numerical Determination of Debris Jet Length Scales and Depositional Structures in Diatremes. Master of Science Thesis, State University of New York at Buffalo, 2014. Teaters Lindsey C., Battaglia Francine. On the Computational Modeling of Unfluidized and Fluidized Bed Dynamics J. Fluids Eng. 136(10), 104501 (2014). http://dx.doi.org/10.1115/1.4027437. Anna Trendewicz, Robert Braun, Abhijit Dutta, Jack Ziegler, One dimensional steady-state circulating fluidized-bed reactor model for biomass fast pyrolysis, Fuel, Volume 133, 1 October 2014, Pages 253-262.http://dx.doi.org/10.1016/j.fuel.2014.05.009. Verma, Vikrant, Johan T. Padding, Niels G. Deen, J. A. M. (Hans) Kuipers, Frank Barthel, Martina Bieberle, Michael Wagner, and Uwe Hampel. 2014. Bubble dynamics in a 3-D gas-solid fluidized bed using ultrafast electron beam X-ray tomography and two?fluid model. AIChE Journal 60, (5): 1632-1644. http://dx.doi.org/10.1002/aic.14393. Wei Xu, David S. DeCroix, Xin Sun, Mechanistic based DEM simulation of particle attrition in a jet cup, Powder Technology, Volume 253, February 2014, Pages 385-392. http://dx.doi.org/10.1016/j.powtec.2013.11.031 . Zhao Yunhua, Lu Bing, Zhong Yingjie. Euler-Euler modeling of a gas-solid bubbling fluidized bed with kinetic theory of rough particles. Chemical Engineering Science. 2013 12/18/;104(0):767-79. http://dx.doi.org/10.1016/j.ces.2013.10.001. Yang Shiliang, Luo Kun, Fang Mingming, Zhang Ke, Fan Jianren. Three-Dimensional Modeling of Gas-Solid Motion in a Slot-Rectangular Spouted Bed with the Parallel Framework of the Computational Fluid Dynamics-Discrete Element Method Coupling Approach. Industrial & Engineering Chemistry Research. 2013 Sep 11;52(36):13222-31. http://dx.doi.org/10.1021/ie401811y. Yan Xiaokang, Holloway William, Sundaresan Sankaran. Periodic flow structures in vertical gas-particle flows. Powder Technology. 2013 Jun;241:174-80. http://dx.doi.org/10.1016/j.powtec.2013.03.024. Xiong Q. G., Kong S. C., Passalacqua A. Development of a generalized numerical framework for simulating biomass fast pyrolysis in fluidized-bed reactors. Chemical Engineering Science. 2013 Aug;99:305-13. http://dx.doi.org/ 10.1016/j.ces.2013.06.017. Wang Limin, Zhang Bo, Wang Xiaowei, Ge Wei, Li Jinghai. Lattice Boltzmann based discrete simulation for gas-solid fluidization. Chemical Engineering Science. 2013 Sep 20;101:228-39. http://dx.doi.org/10.1016/j.ces.2013.06.019. Song Jinghui, Wang Tao, Gao Jing, Xiao Xianbin, Dong Changqing, Hu Xiaoying. Erosion in the rectangular biomass circulating fluidized bed. In: Li Y. G., Li Y., Pan W. G., editors. Progress in Renewable and Sustainable Energy, Pts 1 and 2; 2013. p. 214-9. http://dx.doi.org/10.4028/www.scientific.net/AMR.608-609.214. Sarkar A., Sun X., Sundaresan S. Sub-grid drag models for horizontal cylinder arrays immersed in gas-particle multiphase flows. Chemical Engineering Science. 2013 Dec;104:399-412. http://dx.doi.org/10.1016/j.ces.2013.08.050. Passalacqua A., Fox R. O. Simulation of Mono- and Bidisperse Gas-Particle Flow in a Riser with a Third-Order Quadrature-Based Moment Method. Industrial & Engineering Chemistry Research. 2013 Jan;52(1):187-98. http://dx.doi.org/10.1021/ie300424m. Oyama T., Agblevor F. , Battaglia F., Klein M. Technical Report on Novel Fast Pyrolysis/Catalytic Technology for the Production of Stable Upgraded Liquids. 2013. Tech Virginia. p. 60. Oger Luc, Savage Stuart B. Airslide flows. Part 2-Flow modeling and comparison with experiments. Chemical Engineering Science. 2013 Mar 22;91:22-34. http://dx.doi.org/10.1016/j.ces.2012.12.042. Navarro Helio A., de Souza Braun Meire P. Determination of the normal spring stiffness coefficient in the linear spring-dashpot contact model of discrete element method. Powder Technology. 2013 Sep;246:707-22. http://dx.doi.org/10.1016/j.powtec.2013.05.049. Milioli C. C., Milioli F. E., Holloway W., Agrawal K., Sundaresan S. Filtered Two-Fluid Models of Fluidized Gas-Particle Flows: New Constitutive Relations. Aiche Journal. 2013;59(9):10. http://dx.doi.org/10.1002/aic.14130. Li T. W., Zhang Y. M. A new model for two-dimensional numerical simulation of pseudo-2D gas-solids fluidized beds. Chemical Engineering Science. 2013 Oct;102:246-56. http://dx.doi.org/10.1016/j.ces.2013.08.019. Hernandez-Jimenez F., Sanchez-Prieto J., Soria-Verdugo A., Acosta-Iborra A. Experimental quantification of the particle-wall frictional forces in pseudo-2D gas fluidised beds. Chemical Engineering Science. 2013 10/11/;102(0):257-67. http://dx.doi.org/10.1016/j.ces.2013.08.020. Glascoe L., Antoun T., Kanarska Y., et al. Technical Report on Evolution of an interfacial crack on the concrete-embankment boundary. 2013. Lawrence Livermore National Laboratory (LLNL) Livermore, CA, USA: LLNL-TR-645956. p. 121. http://dx.doi.org/10.2172/1119958. Estep Joe, Dufek Josef. Discrete element simulations of bed force anomalies due to force chains in dense granular flows. Journal of Volcanology and Geothermal Research. 2013 3/15/;254(0):108-17. http://dx.doi.org/10.1016/j.jvolgeores.2012.12.023. Bai Wei, Keller Norman K. G., Heindel Theodore J., Fox Rodney O. Numerical study of mixing and segregation in a biomass fluidized bed. Powder Technology. 2013 3//;237(0):355-66. http://dx.doi.org/10.1016/j.powtec.2012.12.018. Agrawal K., Holloway W., Milioli C. C., Milioli F. E., Sundaresan S. Filtered models for scalar transport in gas-particle flows. Chemical Engineering Science. 2013 May;95:291-300. http://dx.doi.org/10.1016/j.ces.2013.03.017. Xue Q., Dalluge D., Heindel T. J., Fox R. O., Brown R. C. Experimental validation and CFD modeling study of biomass fast pyrolysis in fluidized-bed reactors. Fuel. 2012 7//;97(0):757-69. http://dx.doi.org/10.1016/j.fuel.2012.02.065. Tan Qinliang, Liu Tian, Jiang Dalong, Hu Xiaoying, Dong Changqing. Numerical simulation of dual-support leg fluidized bed. In: Pan W., Ren J. X., Li Y. G., editors. Renewable and Sustainable Energy, Pts 1-7; 2012. p. 627-30. http://dx.doi.org/10.4028/www.scientific.net/AMR.347-353.627. Song Jinghui, Wang Tao, Hu Xiaoying, Dong Changqing. Erosion mechanism of platen heating surfaces in CFB. In: Chen W. Z., Xu X. P., Dai P. Q., Chen Y. L., editors. Advanced Manufacturing Technology, Pts 1-4; 2012. p. 2287-91. http://dx.doi.org/10.4028/www.scientific.net/AMR.472-475.2287. Rokkam R. Computational fluid dynamic modeling of fluidized-bed polymerization reactors [Doctoral Dissertation]: Iowa State University, Ames, Iowa; 2012. p. 132. Razavi Behzad Saeedi, Hosseini Seyyed Hossein. Computational Fluid Dynamics Studies of Hydrodynamic Parameters in a Two-Dimensional Conical Spouted Bed. Asian Journal of Chemistry. 2012 Aug;24(8):3571-8. Murgia S., Vascellari M., Cau G. Comprehensive CFD model of an air-blown coal-fired updraft gasifier. Fuel. 2012 11//;101(0):129-38. http://dx.doi.org/10.1016/j.fuel.2011.08.065. Li Yongchao, Che Defu, Liu Yinhe. CFD simulation of hydrodynamic characteristics in a multiple-spouted bed. Chemical Engineering Science. 2012 10/1/;80(0):365-79. http://dx.doi.org/10.1016/j.ces.2012.06.003. Kumar Apurv, Hodgson Peter, Fabijanic Daniel, Gao Weimin. Numerical solution of gas-solid flow in fluidised bed at sub-atmospheric pressures. Advanced Powder Technology. 2012 Jul;23(4):485-92. http://dx.doi.org/10.1016/j.apt.2012.04.010. Jalalinejad Farzaneh, Bi Xiaotao T., Grace John R. Effect of electrostatic charges on single bubble in gas-solid fluidized beds. International Journal of Multiphase Flow. 2012 Sep;44:15-28. http://dx.doi.org/10.1016/j.ijmultiphaseflow.2012.03.008. Igci Yesim, Pannala Sreekanth, Benyahia Sofiane, Sundaresan Sankaran. Validation Studies on Filtered Model Equations for Gas-Particle Flows in Risers. Industrial & Engineering Chemistry Research. 2012 Feb 1;51(4):2094-103. http://dx.doi.org/10.1021/ie2007278. Hu Xiaoying, Wang Tao, Song Jinghui, Dong Changqing, Ieee. Research on wear mechanism of dense phase area in fluidized bed. 2012 Asia-Pacific Power and Energy Engineering Conference; 2012. Holloway William, Sundaresan Sankaran. Filtered models for reacting gas-particle flows. Chemical Engineering Science. 2012 Sep 12;82:132-43. http://dx.doi.org/10.1016/j.ces.2012.07.019. Herzog Nicoleta, Schreiber Matthias, Egbers Christoph, Krautz Hans Joachim. A comparative study of different CFD-codes for numerical simulation of gas-solid fluidized bed hydrodynamics. Computers & Chemical Engineering. 2012 Apr 6;39:41-6. http://dx.doi.org/10.1016/j.compchemeng.2011.12.002. Gaspar Branco da Silva Fernanda Ribeiro, de Souza Marcos, de Souza da Costa Alexandre Marconi, de Matos Jorge Luiz Mario, Paraiso Paulo Roberto. Experimental and numerical analysis of soybean meal drying in fluidized bed. Powder Technology. 2012 Oct;229:61-70. http://dx.doi.org/10.1016/j.powtec.2012.06.008. Feng Z.-G. Final Technical Report on Use of an Accurate DNS Particulate Flow Method to Supply and Validate Boundary Conditions for the MFIX Code. 2012. National Energy Technology Laboratory (NETL) Morgantown, WV, USA, Antonio University Of Texas At San. p. 26. http://dx.doi.org/10.2172/1055214. Dutta A., Constales D., Heynderickx G. J. Applying the direct quadrature method of moments to improve multiphase FCC riser reactor simulation. Chemical Engineering Science. 2012 Dec;83:93-109. http://dx.doi.org/ 10.1016/j.ces.2012.04.036. Di Carlo Andrea, Foscolo Pier Ugo. Hot syngas filtration in the freeboard of a fluidized bed gasifier: Development of a CFD model. Powder Technology. 2012 May;222:117-30. http://dx.doi.org/10.1016/j.powtec.2012.02.019. de Souza Braun Meire Pereira, Palma Geraldo Luiz, Navarro Helio Aparecido, Varoto Paulo Sergio, Asme. DETERMINATION OF MINIMUM FLUIDIZATION VELOCITY FOR GAS-SOLID BEDS BY EXPERIMENTAL DATA AND NUMERICAL SIMULATIONS; 2012.
da Silva Fernanda Ribeiro Gaspar Branco, de Souza Marcos, da Costa Alexandre Marconi de Souza, Jorge Luiz Mario de Matos, Paraiso Paulo Roberto. Experimental and numerical analysis of soybean meal drying in fluidized bed. Powder Technology. 2012 10//;229(0):61-70. http://dx.doi.org/10.1016/j.powtec.2012.06.008. Cordiner S., De Simone G., Mulone V. Experimental-numerical design of a biomass bubbling fluidized bed gasifier for paper sludge energy recovery. Applied Energy. 2012 9//;97(0):532-42. http://dx.doi.org/10.1016/j.apenergy.2011.11.024. Brenner Thomas A., Fontenot Raymond L., Cizmas Paul G. A., O’Brien Thomas J., Breault Ronald W. A reduced-order model for heat transfer in multiphase flow and practical aspects of the proper orthogonal decomposition. Computers & Chemical Engineering. 2012 8/10/;43(0):68-80. http://dx.doi.org/10.1016/j.compchemeng.2012.04.003. Azizi Salar, Mowla Dariush, Ahmadi Goodarz. Numerical evaluation of turbulence models for dense to dilute gas-solid flows in vertical conveyor. Particuology. 2012 10//;10(5):553-61. http://dx.doi.org/10.1016/j.partic.2011.12.006. Xue Q., Heindel T. J., Fox R. A CFD model for biomass fast pyrolysis in fluidized-bed reactors. Chemical Engineering Science. 2011 Jun;66(11):2440-52. http://dx.doi.org/10.1016/j.ces.2011.03.010. Sundaresan S., Tardos G. I., Subramaniam S. Final Technical Report on Rheological Behavior of Dense Assemblies of Granular Materials. 2011. Princeton University Princeton, NJ, USA. p. 297. http://dx.doi.org/10.2172/1026503. Sun X., Rink N. Final Technical Report on Development of a Hydrogasification Process for Co-Production of Substitute Natural Gas (SNG) and Electric Power from Western Coals. 2011. (NETL) National Energy Technology Laboratory, Company Arizona Public Service. p. 1207. http://dx.doi.org/10.2172/1121246. Reuge Nicolas, Caussat Brigitte. Modeling of Silicon CVD into Agglomerates of Sub-micrometer-size Particles in a Fluidized Bed. Chemical Vapor Deposition. 2011 Dec;17(10-12):305-11. http://dx.doi.org/10.1002/cvde.201106888. Passalacqua A., Fox R. O. Advanced continuum modelling of gas-particle flows beyond the hydrodynamic limit. Applied Mathematical Modelling. 2011 Apr;35(4):1616-27. http://dx.doi.org/10.1016/j.apm.2010.09.038. Moraveji Mostafa Keshavarz, Sokout Fatemeh Sadat, Rashidi Alimorad. CFD modeling and experimental study of multi-walled carbon nanotubes production by fluidized bed catalytic chemical vapor deposition. International Communications in Heat and Mass Transfer. 2011 8//;38(7):984-9. http://dx.doi.org/10.1016/j.icheatmasstransfer.2011.03.029. Kim Yong Nam, Wu Changning, Cheng Yi. CFD simulation of hydrodynamics of gas-solid multiphase flow in downer reactors: revisited. Chemical Engineering Science. 2011 11/1/;66(21):5357-65. http://dx.doi.org/10.1016/j.ces.2011.07.036. Igci Yesim, Sundaresan Sankaran. Verification of Filtered Two-Fluid Models for Gas-Particle Flows in Risers. Aiche Journal. 2011 Oct;57(10):2691-707. http://dx.doi.org/10.1002/aic.12486. Hrenya C. M., Cocco R., Fox R., Subramaniam S., Sundaresan S. Final Technical Report on Development, Verification, and Validation of Multiphase Models for Polydisperse Flows. 2011. (NETL) National Energy Technology Laboratory, Colorado University Of. p. 559. http://dx.doi.org/10.2172/1039998. Heske C., Moujaes S., Weimer A., et al. Technical Report on High Efficiency Generation of Hydrogen Fuels Using Solar Thermochemical Splitting of Water. 2011. UNLV Research Foundation Las Vegas, Nevada, USA: DOE/GO/13062/Final. p. 400. http://dx.doi.org/10.2172/1025597. Hernandez-Jimenez F., Third J. R., Acosta-Iborra A., Muller C. R. Comparison of bubble eruption models with two-fluid simulations in a 2D gas-fluidized bed. Chemical Engineering Journal. 2011 Jun;171(1):328-39. http://dx.doi.org/10.1016/j.cej.2011.04.013. Farzaneh Meisam, Sasic Srdjan, Almstedt Alf-Erik, Johnsson Filip, Pallares David. A novel multigrid technique for Lagrangian modeling of fuel mixing in fluidized beds. Chemical Engineering Science. 2011 11/15/;66(22):5628-37. http://dx.doi.org/10.1016/j.ces.2011.07.060. Darabi Pirooz, Pougatch Konstantin, Salcudean Martha, Grecov Dana. DEM investigations of fluidized beds in the presence of liquid coating. Powder Technology. 2011 Dec 25;214(3):365-74. http://dx.doi.org/10.1016/j.powtec.2011.08.032. Kim Kibum, Moujaes Samir F., Kolb Gregory J. Experimental and simulation study on wind affecting particle flow in a solar receiver. Solar Energy. 2010 Feb;84(2):263-70. http://dx.doi.org/10.1016/j.solener.2009.11.005. Kashyap Mayank, Gidaspow Dimitri. Computation and measurements of mass transfer and dispersion coefficients in fluidized beds. Powder Technology. 2010 10/25/;203(1):40-56. http://dx.doi.org/10.1016/j.powtec.2010.03.025. Reuge N., Cadoret L., Caussat B. Multifluid Eulerian modelling of a silicon Fluidized Bed Chemical Vapor Deposition process: Analysis of various kinetic models. Chemical Engineering Journal. 2009 May 15;148(2-3):506-16. http://dx.doi.org/10.1016/j.cej.2008.12.017. Passalacqua A., Marmo L. A critical comparison of frictional stress models applied to the simulation of bubbling fluidized beds. Chemical Engineering Science. 2009 Jun 15;64(12):2795-806. http://dx.doi.org/10.1016/j.ces.2009.03.005. Li T. W., Pougatch K., Salcudean M., Grecov D. Mixing of secondary gas injection in a bubbling fluidized bed. Chemical Engineering Research & Design. 2009 Nov;87(11A):1451-65. http://dx.doi.org/10.1016/j.cherd.2009.04.012. Kim Kibum, Siegel Nathan, Kolb Greg, Rangaswamy Vijayarangan, Moujaes Samir F. A study of solid particle flow characterization in solar particle receiver. Solar Energy. 2009 10//;83(10):1784-93. http://dx.doi.org/10.1016/j.solener.2009.06.011. Hosseini S. H., Zivdar M., Rahimi R. CFD simulation of gas-solid flow in a spouted bed with a non-porous draft tube. Chemical Engineering and Processing: Process Intensification. 2009 11//;48(11-12):1539-48. http://dx.doi.org/10.1016/j.cep.2009.09.004. Hartge Ernst-Ulrich, Ratschow Lars, Wischnewski Reiner, Werther Joachim. CFD-simulation of a circulating fluidized bed riser. Particuology. 2009 Aug;7(4):283-96. http://dx.doi.org/10.1016/j.partic.2009.04.005. Gidaspow D., Jiradilok V., Kashyap M., Chalermsinsuwan B. Final Technical Report on Gasificaton Transport: A Multiphase CFD Approach & Measurements. 2009. Technology Illinois Institute Of. p. 82. http://dx.doi.org/10.2172/966356. Dan Sun, Shuyan Wang, Gougdong Liu, Shuai Wang, Yongjian Liu, Lixin Wei. Simulations of flow behavior of gas and particles in a spouted bed using a second-order moment method-frictional stresses model. Chemical Engineering Science. 2010 5/1/;65(9):2635-48. http://dx.doi.org/10.1016/j.ces.2009.12.042. Cadoret L., Reuge N., Pannala S., et al. Silicon Chemical Vapor Deposition on macro and submicron powders in a fluidized bed. Powder Technology. 2009 Mar 5;190(1-2):185-91. http://dx.doi.org/10.1016/j.powtec.2008.04.083. Yin Chungen, Rosendahl Lasse A., Kaer Soren K. Grate-firing of biomass for heat and power production. Progress in Energy and Combustion Science. 2008 12//;34(6):725-54. http://dx.doi.org/10.1016/j.pecs.2008.05.002. Xie Nan, Battaglia Francine, Pannala Sreekanth. Effects of using two- versus three-dimensional computational modeling of fluidized beds: Part II, budget analysis. Powder Technology. 2008 2/15/;182(1):14-24. http://dx.doi.org/10.1016/j.powtec.2007.09.014. Wang Shuyan, Shen Zhiheng, Lu Huilin, Yu Long, Liu Wentie, Ding Yonlong. Numerical predictions of flow behavior and cluster size of particles in riser with particle rotation model and cluster-based approach. Chemical Engineering Science. 2008 Aug 16;63(16):4116-25. http://dx.doi.org/10.1016/j.ces.2008.05.021. Tsimring L. S. Final Technical Report on Modeling for Process Control: High-Dimensional Systems. 2008. University of California University of California, San Diego, USA: DOE/ER/14138-1; TRN: US201003%%182. p. 5. http://dx.doi.org/10.2172/937090. Services Southern Company. Technical Report on Power Systems Development Facility Gasification Test Campaign TC22. 2008. Southern Company Services Incorporation Wilsonville, Al, USA. p. 64. http://dx.doi.org/10.2172/1000470. Reuge N., Cadoret L., Coufort-Saudejaud C., Pannala S., Syamlal M., Caussat B. Multifluid Eulerian modeling of dense gas-solids fluidized bed hydrodynamics: Influence of the dissipation parameters. Chemical Engineering Science. 2008 Nov 16;63(22):5540-51. http://dx.doi.org/10.1016/j.ces.2008.07.028. Nemtsov D. A., Zabaniotou A. Mathematical modelling and simulation approaches of agricultural residues air gasification in a bubbling fluidized bed reactor. Chemical Engineering Journal. 2008 9/15/;143(1-3):10-31. http://dx.doi.org/10.1016/j.cej.2008.01.023. Jung J. W., Gamwo I. K. Multiphase CFD-based models for chemical looping combustion process: Fuel reactor modeling. Powder Technology. 2008 Apr 21;183(3):401-9. http://dx.doi.org/10.1016/j.powtec.2008.01.019. Igci Yesim, Andrews Arthur T., Sundaresan Sankaran, Pannala Sreekanth, O’Brien Thomas. Filtered two-fluid models for fluidized gas-particle suspensions. Aiche Journal. 2008 Jun;54(6):1431-48. http://dx.doi.org/10.1002/aic.11481. Bryden K., Hess J. R., Ulrich T., Zemetra R. Final Technical Report: DOE/ID/14215 2008. University Iowa State: DOE/ID/14215; TRN: US200902%%226. p. 45. http://dx.doi.org/10.2172/935984. Battaglia F. Final Technical Report on Detailed Reaction Kinetics for CFD Modeling of Nuclear Fuel Pellet Coating for High Temperature Gas-Cooled Reactors. 2008. University Iowa State: DOE-ID14661-1; TRN: US0900513. p. 11. http://dx.doi.org/10.2172/942124. Banerjee S., Chen A., Patel R., et al. Final Report on Enhanced Productivity of Chemical Processes Using Dense Fluidized Beds. 2008. Chemicals Millennium Inorganic: TRN: US200809%%686. p. 106. http://dx.doi.org/10.2172/924394. Xie N. Computational analyses for modeling fluidized bed gasification processes [Doctoral Dissertation]: Iosa State University, Ames, Iowa, USA; 2007. p. 174. Whitty K. Final Technical Report on Investigation of Fuel Chemistry and Bed Performance in a Fluidized Bed Black Liquor Steam Reformer. 2007. University Of Utah Salt Lake City, UT, USA. p. 179. http://dx.doi.org/10.2172/926666. Weber Michael W., Hrenya Christine M. Computational study of pressure-drop hysteresis in fluidized beds. Powder Technology. 2007 8/25/;177(3):170-84. http://dx.doi.org/10.1016/j.powtec.2007.01.016. Sun Jin, Battaglia Francine, Subramaniam Shankar. Hybrid two-fluid DEM simulation of gas-solid fluidized beds. Journal of Fluids Engineering-Transactions of the Asme. 2007 Nov;129(11):1394-403. http://dx.doi.org/10.1115/1.2786530. Sun J. Mutiscale Modeling of Segregation in Granular Flows [Doctoral Dissertation]: Iowa State University, Ames, Iowa; 2007. p. 170. Malony A. D. Technical Report on Performance Engineering Technology for Scientific Component Software. 2007. University of Oregon Eugene, OR: DOE/ER25561-Final; TRN: US200816%%658. p. 12. http://dx.doi.org/10.2172/909872. Galvin J. E. On The Hydrodynamic Description of Binary Mixtures of Rapid Granular Flows and Gas-Fluidized Beds [Doctoral Dissertation]: University of Colorado, Boulder, CO, USA; 2007. p. 523. Fan R., Fox R. O. Segregation in polydisperse fluidized beds: Validation of a multi-fluid model. Chemical Engineering Science. 2008 Jan;63(1):272-85. http://dx.doi.org/10.1016/j.ces.2007.09.038. El Kawi O. S. Abd, Atwan E. F., Abdelmonem S. A., Abdalla A. M., Elshazly K. M. Hydrodynamic and thermal modelling of gas-particle flow in fluidized beds. International Journal of Chemical Reactor Engineering. 2007 Sep 4;5. Dartevelle S., Valentine G. A. Transient multiphase processes during the explosive eruption of basalt through a geothermal borehole (Namafjall, Iceland, 1977) and implications for natural volcanic flows. Earth and Planetary Science Letters. 2007 10/30/;262(3-4):363-84. http://dx.doi.org/10.1016/j.epsl.2007.07.053. Dartevelle S. Technical Report on From model conception to verification and validation, a global approach to multiphase Navier-Stoke models with an emphasis on volcanic explosive phenomenology. 2007. Los Alamos National Laboratory (LANL) Los Alamos, NM, USA: LA-14346; TRN: US200909%%265. p. 92. http://dx.doi.org/10.2172/948564. Weber Michael W., Hrenya Christine M. Square-well model for cohesion in fluidized beds. Chemical Engineering Science. 2006 Jul;61(14):4511-27. http://dx.doi.org/10.1016/j.ces.2006.02.008. Sundaresan Sankaran, Andrews Arthur T., Igci Yesim. Coarse-graining of two-fluid models for fluidized gas-particle suspension. Abstracts of Papers of the American Chemical Society. 2006 Mar 26;231. Sun J., Battaglia F. Hydrodynamic modeling of particle rotation for segregation in bubbling gas-fluidized beds. Chemical Engineering Science. 2006 Mar;61(5):1470-9. http://dx.doi.org/10.1016/j.ces.2005.09.003. Sousa Jr Ruy, Colmati Flavio, Gonzalez Ernesto Rafael. Modeling techniques applied to the study of gas diffusion electrodes and proton exchange membrane biochemical fuel cells. Journal of Power Sources. 2006 10/20/;161(1):183-90. http://dx.doi.org/10.1016/j.jpowsour.2006.03.094. Pannala S., Daw S. C., Boyalakuntla D. S., Finney C. E. A. Technical Report on Process Modeling Phase I Summary Report for the Advanced Gas Reactor Fuel Development and Qualification Program. 2006. Oak Ridge National Laboratory (ORNL) Oak Ridge, Tennessee, USA: ORNL/TM-2006/520; AF3610200; NEAF260. p. 49. http://dx.doi.org/10.2172/1052234. Makkawi Y. T., Wright P. C., Ocone R. The effect of friction and inter-particle cohesive forces on the hydrodynamics of gas-solid flow: A comparative analysis of theoretical predictions and experiments. Powder Technology. 2006 Apr 25;163(1-2):69-79. http://dx.doi.org/10.1016/j.powtec.2006.01.020. Jung J. W., Gidaspow D., Gamwo I. K. Bubble computation, granular temperatures, and reynolds stresses. Chemical Engineering Communications. 2006 Aug;193(8):946-75. http://dx.doi.org/10.1080/00986440500351982. Holder G., Mathews J., Wilson T., et al. Final Technical Report on University/NETL Student Partnership Program 2006. (NETL) National Energy Technology Laboratory, University Of Pittsburgh Pittsburgh, Pennsylvania, USA. p. 39. http://dx.doi.org/10.2172/928838. Fan R. Computational Fluid Dynamics Simulation of Fluidized Bed Polymerization Reactors [Doctoral Dissertation]: Iowa State University, Ames, Iowa; 2006. p. 197. Das Sharma S., Pugsley T., Delatour R. Three-dimensional CFD model of the deaeration rate of FCC particles. Aiche Journal. 2006 Jul;52(7):2391-400. http://dx.doi.org/10.1002/aic.10858. Dartevelle S. Technical Report on Geophysical Multiphase Flow With Interphase Exchanges Hydrodynamic and Thermodynamic Models, and Numerical Techniques, Version FMFIX-1.61, Design Document Attachment 1. 2006. Los Alamos National Laboratory (LANL) Los Alamos, NM, USA: MOL.20061005.0023; DC# 48387; TRN: US0700395. p. 63. http://dx.doi.org/10.2172/894813. Cabezas-Gomez L., Silva R. C., Milioli F. E. Some modeling and numerical aspects of the two-fluid simulation of the gas-solids flow in a CFB riser. Brazilian Journal of Chemical Engineering. 2006 Oct-Dec;23(4):487-96. Whitty K. Annual Technical Report on Investigation of Fuel Chemistry and Bed Performance in a Fluidized Bed Black Liquor Steam Reformer. 2005. University Of Utah Salt Lake City, UT, USA. p. 83. http://dx.doi.org/10.2172/850294. van der Lee L., Chandrasekaran B., Hulme I., Kantzas A. A non-invasive hydrodynamic study of gas-solid fluidised bed of linear low density polyethylene. Canadian Journal of Chemical Engineering. 2005 Feb;83(1):119-26. Miller A. L. Final Technical Report on Numerical Modeling of Reactive Multiphase Flow for FCC and Hot Gas Desulfurization Circulating Fluidized Beds. 2005. West Virginia University Research Corporation Morgantown, WV, USA: DOE/ER/45727-1; TRN: US200712%%217. p. 139. http://dx.doi.org/10.2172/877149. Krier D. Technical Report on Magma Dynamics at Yucca Mountain, Nevada. 2005. Bechtel SAIC Company LCC, Las Vegas, Nevada, USA: ANL-MGR-GS-000005 REV 00; DOC.20050829.0006; DC#44674; TRN: US0504601. p. 114. http://dx.doi.org/10.2172/859089. Dufek J., Bergantz G. W. Transient two-dimensional dynamics in the upper conduit of a rhyolitic eruption: A comparison of closure models for the granular stress. Journal of Volcanology and Geothermal Research. 2005 5/1/;143(1-3):113-32. http://dx.doi.org/10.1016/j.jvolgeores.2004.09.013. Dartevelle S., Valentine G. A. Early-time multiphase interactions between basaltic magma and underground openings at the proposed Yucca Mountain radioactive waste repository. Geophysical Research Letters. 2005 Nov 30;32(22). http://dx.doi.org/10.1029/2005gl024172. Dartevelle S. Technical Report on Comprehensive Approaches to Multiphase Flows in Geophysics – Application to nonisothermal, nonhomogenous, unsteady, large-scale, turbulent dusty clouds I. Hydrodynamic and Thermodynamic RANS and LES Models. 2005. Los Alamos National Laboratory (LANL) Los Alamos, NM, USA: LA-14228; TRN: US200612%%789. p. 128. http://dx.doi.org/10.2172/881277. Chandrasekaran B. K., van der Lee L., Hulme I., Kantzas A. A simulation and experimental study of the hydrodynamics of a bubbling fluidized bed of linear low density polyethylene using bubble properties and pressure fluctuations. Macromolecular Materials and Engineering. 2005 Jun 24;290(6):592-609. http://dx.doi.org/10.1002/mame.200500065. Breault R. W., Shadle L. J., Pandey P. Granular temperature, turbulent kinetic energy and solids fraction of cork particles at the wall in the riser of a CFB; 2005. In Cen, K (Ed. ), Circulating Fluidized Bed Technology VIII (pp. 755-761). Hangzhou, China: Int Academic Publisers. Andrews A. T., Loezos P. N., Sundaresan S. Coarse-grid simulation of gas-particle flows in vertical risers. Industrial & Engineering Chemistry Research. 2005 Aug 3;44(16):6022-37. http://dx.doi.org/10.1021/ie0492193. Xie N., Battaglia F., Fox R. O. Simulations of multiphase reactive flows in fluidized beds using in situ adaptive tabulation. Combustion Theory and Modelling. 2004 Jun;8(2):195-209. http://dx.doi.org/10.1088/1364-7830/8/2/001. Weber M. W. Simulation of Cohesive Particle Flows in Granular and Gas-Solid Systems [Doctoral Dissertation]: University of Colorado, Boulder, CO, USA; 2004. p. 223. Wang Xiaohua, Zhu Chao, Ahluwalia Rajesh. Numerical simulation of evaporating spray jets in concurrent gas-solids pipe flows. Powder Technology. 2004 2/16/;140(1-2):56-67. http://dx.doi.org/http://dx.doi.org/10.1016/j.powtec.2003.08.063. Sundaresan S. Final Technical Report on Coarse-Grid Simulation of Reacting and Non-Reacting Gas-Particle Flows. 2004. Princeton University Princeton, NJ, USA. p. 215. http://dx.doi.org/10.2172/836624. Sun J., Battaglia F. Effects of Particle Rotation on the Hydrodynamic Modeling of Segregation in Gas-Fluidized Beds. ASME 2004 International Mechanical Engineering Congress and Exposition; 2004; Anaheim, California, USA; 2004. p. 745-53. Lu H. L., He Y. R., Liu W. T., Ding J. M., Gidaspow D., Bouillard J. Computer simulations of gas-solid flow in spouted beds using kinetic-frictional stress model of granular flow. Chemical Engineering Science. 2004 Mar;59(4):865-78. http://dx.doi.org/10.1016/j.ces.2003.10.018. Dartevelle S., Rose W. I., Stix J., Kelfoun K., Vallance J. W. Numerical modeling of geophysical granular flows: 2. Computer simulations of plinian clouds and pyroclastic flows and surges. Geochemistry Geophysics Geosystems. 2004 Aug 18;5. http://dx.doi.org/10.1029/2003gc000637. Dartevelle S. Numerical modeling of geophysical granular flows: 1. A comprehensive approach to granular rheologies and geophysical multiphase flows. Geochemistry Geophysics Geosystems. 2004 Aug 18;5. http://dx.doi.org/10.1029/2003gc000636. Calo J. M. Final Report on Spouted Bed Electrodes (SBE) For Direct Utilization of Carbon In Fuel Cells. 2004. National Energy Technology Laboratory (NETL) Pittsburgh, PA, USA, Brown University Providence, Rhode Island, USA. p. 59. http://dx.doi.org/10.2172/841009. Bockelie M., Swensen D., Denison M., Sarofim A., Senior C. Final Report on A Computational Workbench Environment For Virtual Power Plant Simulation. 2004. National Energy Technology Laboratory (NETL) Pittsburgh, PA, and Morgantown, WV, USA, Reaction Engineering International Salt Lake City, Utah, USA. p. 444. http://dx.doi.org/10.2172/837892. Whitty K. Annual Technical Report on Investigation of Fuel Chemistry and Bed Performance in a Fluidized Bed Black Liquor Steam Reformer. 2003. University Of Utah Salt Lake City, UT, USA. p. 75. http://dx.doi.org/10.2172/841593. Sundaresan S. Technical Report on Coarse-Grid Simulation of Reacting and Non-Reacting Gas-Particle Flows. 2003. Princeton University Princeton, NJ, USA. p. 98. http://dx.doi.org/10.2172/822872. Srivastava A., Sundaresan S. Analysis of a fractional-kinetic model for gas-particle flow. Powder Technology. 2003 Jan 8;129(1-3):72-85. http://dx.doi.org/10.1016/s0032-5910(02)00132-8. McKeen Tim, Pugsley Todd S. Simulation of Cold Flow FCC Stripper Hydrodynamics at Small Scale Using Computational Fluid Dynamics. International Journal of Chemical Reactor Engineering. 2003 2003;1. McKeen T., Pugsley T. Simulation and experimental validation of a freely bubbling bed of FCC catalyst. Powder Technology. 2003 Jan 8;129(1-3):139-52. http://dx.doi.org/10.1016/s0032-5910(02)00294-2. Loezos P. N. An investigation into dense and dilute gas particle flow [Doctoral Dissertation]: Princeton University, Princeton, NJ, USA; 2003. Holder G. D. Technical Report on University/NETL Student Partnership Program: 3rd year. 2003. (NETL) National Energy Technology Laboratory, University Of Pittsburgh Pittsburgh, Pennsylvania, USA. p. 1038. http://dx.doi.org/10.2172/812561. Gelderbloom S. J., Gidaspow D., Lyczkowski R. W. CFD simulations of bubbling/collapsing fluidized beds for three Geldart groups. Aiche Journal. 2003 Apr;49(4):844-58. http://dx.doi.org/10.1002/aic.690490405. Fan R., Marchisio D. L., Fox R. O. Application of the direct quadrature method of moments to polydisperse gas-solid fluidized beds. Powder Technology. 2004 Jan;139(1):7-20. http://dx.doi.org/10.1016/j.powtech.2003.10.005. Faletra P., Clark T., Jones R., et al. Journal of Undergraduate Research, Volume III, 2003. 2003. Federal Energy Technology Center Morgantown, WV, USA. p. 157. Energy Assistant Secretary for Fossil. Technical Report on Clean Coal Technology Programs: Program Update 2003 (Volume 1). 2003. Technology & Management Services Inc.: DOE/FE-0459-1; TRN: US200903%%176. p. 224. http://dx.doi.org/10.2172/827244. Dartevelle S. Numerical and granulometric approaches to geophysical granular flows [Doctoral Dissertation]: Michigan Technological University; 2003. p. 116. Cizmas P. Final Technical Report on A Reduced Order Model Of Two-Phase Flow, Heat Transfer and Combustion In Circulating Fluidized-Beds. 2003. Texas Engineering Experiment Station College Station, Texas, USA. p. 71. http://dx.doi.org/10.2172/827038. Boyalakuntla D. S. Simulation of Granular and Gas-Solid Flows using Discrete Element Method [Doctoral Dissertation]: Carnegie Mellon University; 2003. p. 184. Xie N. Simulations of multiphase reactive flows in fluidized beds using in situ adaptive tabulation method [Master’s Thesis]: Iosa State University, Ames, Iowa, USA; 2002. Srivastava A. Dense Phase Gas-solid Flows in Circulating Fluidized Beds [Doctoral Dissertation]: Princeton University, Princeton, NJ, USA; 2002. p. 406. Loezos P. N., Sundaresan S. The role of meso-scale structures on dispersion in gas-particle flows. In: Grace J. R., Zhu J., de Lasa H. I., editors. 7th International Conference on Circulating Fluidized Beds, May 5 – May 8, 2002; 2002; Niagara Falls, Ontario, Canada: Canadian Society for Chemical Engineering; 2002. p. 427-34. Cizmas P. Annual Technical Report on A Reduced Order Model Of Two-Phase Flow, Heat Transfer and Combustion In Circulating Fluidized-Beds. 2002. Texas Engineering Experiment Station College Station, Texas, USA. http://dx.doi.org/10.2172/813624. Corporation The Foster Wheeler Development, (NETL) The National Energy Technology Laboratory. Final Report for CRADA No. 97-F001. 2000. National Energy Technology Laboratory (NETL) Morgantown, WV, and Pittsburgh, PA, USA, Foster Wheeler Development Corporation Livingston, NJ, USA: DOE/NETL-2001/1137; Contract CRADA 97-F001; TRN: AH200101%%10. p. 94. http://dx.doi.org/10.2172/772551. Bockelie M., Swensen D., Denison M. Technical Report on A Computational Workbench Environment For Virtual Power Plant Simulation. 2001. National Energy Technology Laboratory (NETL) Pittsburgh, PA, and Morgantown, WV, USA, Reaction Engineering International Salt Lake City, Utah, USA: TRN: US200212%%38. p. 20. http://dx.doi.org/10.2172/786011. Toseland B. A. Technical Report on Engineering Development of Slurry Bubble Column Reactor (SBCR) Technology. 2000. Air Products and Chemicals Inc., Allentown, PA, USA. p. 53. http://dx.doi.org/10.2172/822929. Agrawal K. The role of meso-scale structures in rapid granular and gas solid flows [Doctoral Dissertation]: Princeton University, Princeton, NJ, USA; 2000. p. 179. Brown M. Science and Technology Highlights of ORNL’s Energy Efficiency and Renewable Energy Program, Number 1, 1999. 1999. Oak Ridge National Laboratory (ORNL) Oak Ridge, Tennessee, USA: ORNL/STH-1999/1; TRN: AH200130%%81. p. 157. http://dx.doi.org/10.2172/14760. Gera D., Gautam M., Tsuji Y., Kawaguchi T., Tanaka T. Computer simulation of bubbles in large-particle fluidized beds. Powder Technology. 1998 7/15/;98(1):38-47. http://dx.doi.org/10.1016/S0032-5910(98)00017-5. Joyce E. L. National laboratories` capabilities summaries for the DOE Virtual Center for Multiphase Dynamics (VCMD). 1997. Los Alamos National Laboratory (LANL) Los Alamos, NM, USA: LA-UR–96-4842; ON: DE97003590; TRN: 97:001683. p. 52. http://dx.doi.org/10.2172/444064. Inc. Advanced Fuel Research. Technical Report on Fossil fuel conversion — Measurement and modeling. 1997. Federal Energy Technology Center Morgantown, WV, USA, Advanced Fuel Research Inc. East Hartford, CT, USA: DOE/MC/30040–2; ON: DE98058980; TRN: AHC29819%%51. p. 216. http://dx.doi.org/10.2172/665897. Final Report on Development of a high-performance coal-fired power generating system with pyrolysis gas and char-fired high temperature furnace (HITAF). 1996. Pittsburgh Energy Technology Center Pittsburgh, Pennsylvania, USA, Foster Wheeler Development Corp. Livingston, NJ, USA: DOE/PC/91154–T11; ON: DE96010134. p. 238. http://dx.doi.org/10.2172/224449. Gray D., Stiles J. M., Celik I. Final Report on Theoretical and numerical studies of constitutive relations for frictional granular flow. 1991. Morgantown Energy Technology Center Morgantown, WV, USA, West Virginia University Morgantown, WV, USA: DOE/MC/24207-3009; ON: DE91002089. p. 168. http://dx.doi.org/10.2172/5119247. Gray D., Stiles J. M. Technical Report on Theoretical and numerical studies of constitutive relations for frictional granular flow. 1990. Morgantown Energy Technology Center Morgantown, WV, USA, West Virginia University Morgantown, WV, USA: DOE/MC/24207-2852; ON: DE90009662.